Diagnosis of hip pain can be more problematic than knee or other limb pain as there is an overlap between hip and lower back and pelvic pain. Furthermore, hip pain can be referred from internal structures. The most common hip problems we see include hip bursitis, osteoarthritis, pain arising from the sacroiliac joints and the lumbar spine, and hamstring tears. For many people, they lack both mobility and proper motor control of the hip. As chiropractors, we utilise various precise procedures to gently mobilise the hip. This is combined with exercises (ranging from basic to advanced) to stretch the muscles and soft tissues. The motor control issues are addressed via adjustments of the spine to support nerve con trol. Specific exercises are employed to retrain the muscles and locomotor system. Hip and associated pain is a common complaint that can be managed using massage therapy. Whilst many people treat hip pain, unfortunately many therapists often only treat the symptoms and overlook the cause of the pain. Muscles many therapists neglect to treat are the muscles of the inner hip and thigh such as psoas and the adductor muscles which help stabilise the hip. These muscles dysfunction by becoming short and weak. The techniques used by our therapists are the techniques that will give great benefit to our patients. Techniques such as deep tissue, trigger point therapy and active muscle release can deactivate muscle spasms, lengthen and release shortened muscles of the hip and increase muscle range of movement. Our massage therapists are highly trained and have over 15 years of experience dealing with some of the very complicated hip pains. We do not settle to give our patients temporary relief, we strive to find the cause of the issue and treat it so our patients could live a pain free lifestyle. Whether the complaint be acute pain due to a sprain or strain, or chronic foot pain because of faulty lower limb biomechanics, chiropractors are well trained in the mechanics of the foot, diagnosis of common foot conditions, neurological disorders and treatment of joint and soft tissue foot problems. Chiropractic treatment for foot and ankle problems encompasses several strategies. Chiropractors are expert in dealing with situations where nerve control of the foot is compromised. Via adjustment of the spine, chiropractors can manage important and often unrecognised factors leading to faulty foot function. Their specialised skills in treating joint problems extends to manipulation of dysfunctional foot and ankle joints. Furthermore, at Health plus Chiropractic, we are especially attuned to treating soft tissue contributions to acute and chronic foot pain. Finally, our focus on rehabilitation means we go beyond standard exercises by implementing state of the art therapeutic approaches for the foot. Hip pain and its associated pain is a common complaint that can be effectively managed using massage therapy. At Health plus Chiropractic, we dig a little deeper than others to identify the cause of dysfunction and pain rather than just treating symptoms. Many therapists neglect to treat the muscles of the inner hip and thigh, such as psoas and the adductor muscles, which help stabilise the hip. These muscles often contribute to dysfunction when they become short and weak. Our massage therapists are highly trained and have over 15 years of experience dealing with a range of complicated hip conditions. The techniques used by our therapists, such as deep tissue massage, trigger point therapy and active muscle release are designed to deactivate muscle spasm, lengthen and release shortened muscles and increase muscle range of movement in the hip joint. We do not settle for temporary relief, but strive to identify and treat the cause of the issue so our patients enjoy a pain free lifestyle. Why not call and experience the difference. Sciatica is the term used for a number of symptoms including pain that is felt in the lower back, buttock, down the leg and foot from irritation of the sciatic nerve. In addition to pain, which is sometimes severe, there may be numbness, muscular weakness, pins and needles or tingling and difficulty in moving or controlling the leg. Typically, the symptoms are only felt on one side of the body. Chiropractic treatment identifies the cause of the irritation to the nerves and manages the acute pain by careful adjustments to the spine and pelvis. We manage severe cases of this condition routinely and draw upon our extensive experience coupled with an ability to assess the whole of spine mechanics, nerve function and soft tissue function and use our rehabilitation focus. Chiropractic adjustments of the spine hold an enviable reputation of rapid effective relief and success for acute lower back pain. Long before the days of research, friends and family knew to send their loved ones to a chiropractor when a lower back crisis occurred. In modern times, there have been more studies into the efficacy of chiropractic treatments for acute pain than any other form of therapy. Consistently, chiropractic management is shown to be conservative, gentle and an approach worth considering. Our team of chiropractor s are very experienced in treating back spasms including sciatica, disc problems, sacroiliac and pelvic pain and plain ‘bad backs’. Our treatments are thorough and are customised to the presentation and clinical picture of each patient. We know that no two spines are the same and therefore management varies to achieve success in the shortest time possible. We employ a variety of techniques from gentle low-force adjustments for patients who feel their back is ‘too hot to handle’, to thorough and substantial techniques for the more stubborn cases. Whatever the acute back problem, we have very extensive experience in diagnosing and treating these severe pain conditions. There are 3 approaches that make chiropractic so effective in dealing with difficult conditions. Firstly, chiropractors are uniquely placed to assess and treat imbalances in neurological function. That is, many chronic lower-back, neck and shoulder pain, headache and limb pain conditions have impaired nerve function as a deeply embedded factor in each condition. If the nervous system is not properly assessed and treated, then no amount of exercise, or medication can restore proper sensation or motor control to the body. Gentle chiropractic adjustments to the spine are integral to restoring nerve function and re-educating the body to better function.Secondly, the hands-on approach employed in chiropractic means that aberrant joint function and abnormal muscle conditions including myositis, fibromyalgia and tendinitis, are quickly recognised and treated. Most people who have enjoyed the benefits of chiropractic are aware how well joint problems are skilfully addressed. Our office specialises in combining thorough muscle assessment with traditional chiropractic approaches. The reputation of chiropractic to give relief for acute spinal pain is well known. Many research studies over the past 20 years also confirm how effective these treatments are for chronic spinal pain.A newer therapeutic strategy is a separate science of chiropractic rehabilitation. A revolution has occurred in the past 15 years in the field of chronic pain and many chiropractors have been at the forefront in creating new management approaches and collecting research evidence to support the new theories. A radical rethink has occurred about the way we manage the neurological, mechanical and behavioural aspects of chronic pain. Science has driven new developments in exercise science, soft tissue injury and manual therapies, and the behaviour of pain and suffering. We have been both early adopters and champions of modern developments in the rehabilitation of chronic pain. You would be surprised to see what we have to offer. If you know someone who has been suffering for too long, tell them how we can help. Massage therapists are experts in the area of soft tissue strain and injury and by direct palpation of the painful area and surrounding tissue ensures that your massage therapist is able to feel and treat soft tissue restriction and trauma. Massage can help ease lower back pain by relaxing overly tight tissues, lengthening shortened muscles, identifying and releasing postural strain patterns and increasing circulation and lymphatic flow in the area. This helps to reduce inflammation, remove toxins and waste products, helping restore normal range of motion. Treatment of lower back pain involves taking a detailed case history to identify potential factors which lead to pain and dysfunction, whether it is a recurrent, chronic issue or an acute injury. This helps to create a management strategy which minimises the chance of experiencing recurrent injuries, and also to ensure that recovery is not impeded by further damage. Massage therapists assess posture, identifying areas of strain and ‘guarding’ or overcompensation of secondary myofascial regions, range of motion and muscular weakness. Chronic lower back pain may be the result of (but not limited to) tight postural muscles, shortened hamstrings, inefficient abdominal or gluteal muscles, incorrect muscle firing patterns when walking, strained ligament and tendons, nerve irritation or entrapment or bony trauma. If the source of the problem is not identified, recovery may be slow or incomplete. Whatever the case, your therapist will design an individualised treatment plan for you at your consultation. We are continually revising our treatment protocols in line with developments in the field. If you or someone you know is experiencing pain, come along and see what we can do for you. Disc conditions in both the neck and back are usually severe, debilitating and challenging for the poor patient. Managing such complex conditions is part of the training and experience of most chiropractors. At Health plus Chiropractic, we do not take these conditions for granted and have ensured that our knowledge and skills are developed so we have as much as possible to offer our patients. We have completed additional training in other techniques that deal with disc herniations (bulges) and associated pain such as sciatica. As per our usual practice, these techniques are widely adopted and have good support by research. If you know someone who is worried by such a problem, suggest they give us call. Knee pain is an increasing problem in society and as a result we see more and more patients with knee problems in our office. 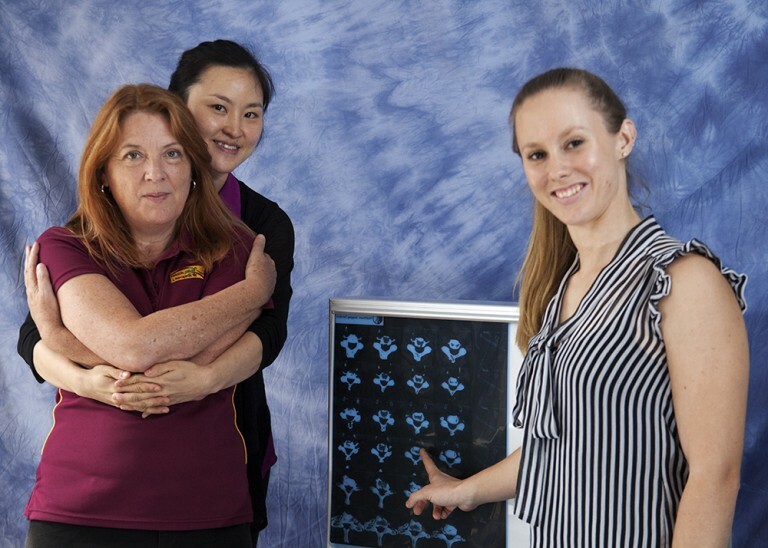 Chiropractic treatment is very effective for many of the problems that cause knee pain and although a condition such as osteoarthritis is not curable, the symptoms can be reduced and the progression of the problem can be helped thanks to our unique approach to treatment. When p ain is perceived as coming from the knee, all the anatomical components need to be examined and in addition to the knee joint, the low back, pelvis, hip, ankle and foot need to be examined due to the direct influence they have on the knee, and vice versa.As chiropractors we take a comprehensive medical history and perform a thorough physical and biomechanical examination in order to make an accurate diagnosis – without an accurate diagnosis, the treatment will not be successful. Our approach of assessing and treating the knee includes the evaluation of the other joints and muscles relating to the knee. This is for several reasons: firstly, pain can be referred from other structures in the low back, pelvis and hip into the knee, in certain conditions and secondly, if other joints in the lower limb are not working correctly they can put increased stress on the knee joint, resulting in injury over time.Therefore to resolve the knee pain chiropractors may also treat other areas, to maximise long-term improvement. 1. Reduce joint inflammation and reduce pain by avoidance of aggravating factors, use of a support, sports tape; ice to reduce inflammation, muscle spasm and pain. 2. Normalise joint function via specific chiropractic manipulation and mobilisation techniques to areas of restricted movement in the knee and surrounding joints, to increase movement, improve the function and reduce pain with Deep soft tissue techniques, trigger-point therapy and cross-friction. 3. Rehabilitation exercise programme. When appropriate we introduce exercises to improve strength, endurance and stability. We also work on improving your balance and your sense of joint position (proprioception). This will help you to return to normal and also prevent new injuries. Knee pain is also a common complaint associated with hip disorders, with pain affecting the joint itself and the surrounding muscles that assist in flexing the knee. The popliteus is a muscle that is sometimes overlooked, due to its ‘hidden’ position at the back of the knee, however, it is an important stabiliser for the knee. Massage is very effective for many complications that cause knee pain, particularly when pain or restriction is due to faulty muscle mechanics, myofascial tension or trigger points. Patello-Femoral Syndrome is one of the more common causes of knee pain amongst athletes accounting for up to one in every four knee injuries. Symptoms include pain at the front of the knee with swelling and tenderness often present. People tend to notice the pain particularly when going up or down stairs or inclines, squatting, kneeling or running.Patello-femoral syndrome may also be aggravated by long periods of sitting with the knees bent. Often the pain develops as an overuse injury seen in long distance runners or cyclists, or it may be initiated by a twisting injury to the knee. It is generally characterised by the incorrect tracking or movement of the patella (knee cap). There are a number of factors that can cause patella-femoral pain syndrome including muscle imbalance, excessive pronation and overloading the knee joint with certain sporting activities. “Shin Splints’ is a vague term used to describe possible anomalies that arise as a stress reaction in the lower leg. While the exact injury is not know, shin splints seem to result from inflammation from injury to the tendon (posterior peroneal tendon) and adjacent tissues in the front of the outer leg. Bone, muscle, tendon or insertion may be the source of pain. People who play sports that involve a lot of running or aggressive walking are particularly prone to this condition. These factors include overuse, excessive pronation, incorrect technique, high impact activities and incorrect sports shoes. If you are experiencing any of the above symptoms related to this condition, please contact our office to arrange a biomechanical assessment to determine which factors are causing your symptoms. Once diagnosed, treatment can include a combination of orthotic therapy, footwear advice and soft-tissue management. Hundreds of thousands of people are suffering with foot pain. Foot and heel pain can become a debilitating condition.Treatment of plantar fasciitis and heel spurs should start conservatively and in most cases, this type of approach will resolve the problem. Treatment in our office can incorporate chiropractic adjustments to correct foot, ankle, knee and pelvic subluxation. The talus is the keyst one of the foot and is frequently subluxated. Rehabilitation of the foot involves correction of subluxations of the lower extremities and pelvis and rehabilitative exercises to address the biomechanical factors that created the subluxations in the first place. Such exercises go beyond calf stretches to incorporate specific training of the gluteal, abdominal or thigh tissues. Chiropractic treatment for foot and ankle problems encompasses several strategies. Chiropractors are experts in dealing with situations where nerve control of the foot is compromised. Via adjustments of the spine, chiropractors can manage important and often unrecognised factors leading to faulty foot function. Their specialised skills in treating joint problems extend to manipulation of dysfunctional foot and ankle joints. At health plus Chiropractic, we are especially attuned to treating soft tissue contributions to acute and chronic foot pain. Finally, our focus on rehabilitation means we go beyond standard exercises by implementing state of the art therapeutic approaches for the foot. Plantar Fasciitis is a condition that affects the foot, where the connective tissues of the bottom of the foot become inflammed. This inflammation or irritation can occur due to heel spurs, unbalanced muscles of the lower leg, faulty biomechanics whilst walking, running or standing. Massage is used to release tight muscles and tendons, specific techniques may also be used to break up adhesions and scar tissue caused by previous injury or strain. Typically stretches, ice therapy and strapping maybe used to relieve the symptoms and pain of plantar fasciitis. Foot problems commonly develop in people with diabetes and can quickly become serious. Several risk factors increase a person with diabetes of developing foot problems and diabetic infections in the legs and feet. Nerve Damage reduces sensation in the feet and can lead to unnoticed injury. Poor Circulation results in injuries or infections to the feet taking longer to heal. Poorly Fitting Shoes are a common cause of diabetic foot problems. If the patient has common foot abnormalities such as flat feet, bunions, or hammertoes, prescription shoes or shoe inserts may be necessary. Infections such as Athlete’s foot or infected ingrown toenails need to be treated promptly before they lead to more serious bacterial infections. The combination of these factors can cause severe complications such as ulceration and amputation. Our podiatry team are trained to assess and treat diabetic foot conditions, including ulcerations. 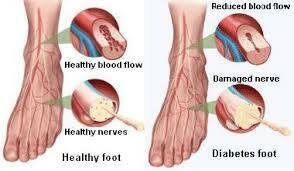 Diabetic patients experiencing any of these symptoms, please seek prompt medical assistance or contact our Podiatrist for a Diabetic Foot Assessment. Your Podiatrists recommend at minimum: an annual foot assessment to identify risk factors. A diabetic foot assessment would include both vascular and neurological testing. We can also advise diabetic patients on foot care and footwear solutions to help prevent future complications such as amputation. Podiatric interventions, including preventative care, wound management and foot orthoses have been demonstrated to significantly reduce rates of foot ulceration and amputation in diabetic sufferers. Our Podiatrists recognise the importance of maintaining a patient’s mobility and independency by alleviating painful foot conditions, particularly for those who have been diagnosed with Diabetes. Call to arrange a Diabetic foot assessment and discuss a preventative care program. In most cases, heel and arch pain are caused by overpronation of the foot and foot subluxations. Overpronation is a rolling in of the foot. A dropped for fallen arch is now an overpronated foot. This overpronation of the foot eventually leads to an inflammation of the fascia, muscles, and ligaments on the bottom of the foot. This condition is diagnosed as plantar fasciitis and if the patient continues to exercise, the inflammation worsens and can lead to calcaneal bursitis. 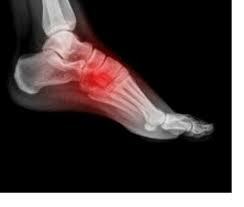 Prolonged inflammation of the plantar fasciitis will eventually lead to a calcaneal traction spur. Calcaneal bursitis is usually extremely painful on rising in the morning. Many patients state that they can barely hobble around for the first 30 minutes of the morning but as the day progresses, pain diminishes. This is due to the change in the bursal sac, which becomes engorged with fluid while the patient is sleeping. This enlarged sac is very painful to put pressure on upon rising. As the body is in a weight bearing position during the day, the fluid is pushed out of the sac only to return again when the body is at rest in the evening. Eliminating running or aerobic activity may lead to a reduced pain level, but in most cases, the injury will reoccur if the biomechanical problem of overpronation is not corrected. Corns & callus are thick hardened layers of skin that are formed in response to pressure and friction. The condition arises as part of the body’s natural defence mechanism. When the thickened skin is concentrated in an area with a core it is referred to as a corn. If the source of the pressure or f riction is not removed, the callus or corn can become painful and in which case require treatment. Treatment by one of our podiatrists starts with an assessment of possible causes, followed by the appropriate treatment. Treatment will include a professional reduction of the callus or corn to relieve pain, supported by customised padding on various areas of the foot to temporarily redistribute pressure. Permanent inserts to wear inside your shoes (orthoses) to offer long term pressure relief and advice on appropriate footwear and foot care.Attempting to self treat corns and callus is not recommended. Using over the counter remedies such as corn plasters often do not treat the underlying cause and can damage healthy surround skin. Achilles tendonitis is a painful and often debilitating inflammation of the Achilles tendon (heel cord). 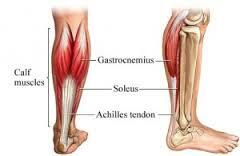 The Achilles tendon is the largest and strongest tendon in the body and is located in the back of the lower leg. The tendon attaches to the heel bone (calcaneus) and connects the leg muscles to the foot – giving us the ability to rise up on our toes, facilitating the act of walking and Achilles tendonitis can make walking almost impossible. It is characterised by pain and swelling which is often worse after periods of rest or with excessive activity. Archilles tendonitis can be caused by a number of different factors including excessive stress, excessive pronation, improper footwear selection, inadequate stretching and direct trauma or injury to the tendon. The condition occurs in approxi mately 6 – 18% of runners, and also is more common in athletes, especially in sports that involve jumping (e.g. basketball), and in people who do a lot of walking. Achilles tendonitis that occurs as a result of arthritis in the heel is more common in people who are middle aged and older. Where conventional podiatric treatments have been exhausted, or for advanced Achilles Tendon injuries more sophisticated treatments are required. The podiatrist will request medical imaging such as ultrasound and MRI to gain a better view of the tendon damage. Once diagnosed, multiple treatment modalities are available including tendon damage debridement and in ruptures reattachment can be carried out. 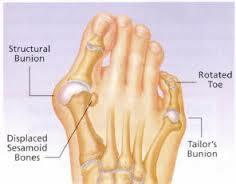 A bunion is a bony prominence on the inside of the big toe joint. It is actually a change in position of a bone called the first metatarsal and not solely a bone growing out of the foot. use of functional orthotics or shoe modification. If conservative treatment fails then surgery should be considered. Untreated bunions often lead to other problems such as hammertoes, stress fractures, corns and calluses, resulting in shoe wear becoming increasingly problematic. A hammertoe is a very common condition where the toes become retracted or clawed. The toes appear bent and often produce a forefoot that is wider and deeper. The hammertoe will often then rub on shoes leading to painful friction and corn formation.Hammertoes develop for many reason including poor foot function (biomechanics), tight shoe wear, genetics and trauma. Hammertoes may be mild and flexible or sever and rigid. Depending on the diagnoses of the type of trauma, podiatrists may recommend an initial treatment using orthotics, toe splints or protective pads. If these prove ineffective then surgery should be considered. A neuroma, sometimes known as Morton’s neuroma is a fibrous thickening of a nerve in the front of the foot. Neuromas can be found in-between any of the long bones of the forefoot (metatarsals) yet commonly occur between the 3rd and 4th metatarsals. They occur due to friction or compression on the effected nerve perhaps from tight shoes or flat feet. Pain is often felt in the ball of the foot as a burning or aching sensation which may have shooting pains towards the associated toes. Pain maybe increased by tight shoes or certain sports. Diagnosis is often made by clinical examination and an ultrasound examination. The treatment of neuromas consists of three alternatives. Firstly, orthotics and shoe wear modification, if unsuccessful then corticosteroid injections can be attempted. If these prove unsuccessful then surgery should be considered. Trauma and arthritis can occur in the mid foot leading to marked pain and deformity. If conservative care fails then surgical correction can be carried out. In early stages before instability and deformity occurs simple “tidy up” procedures can be carried out. In more severe cases joint realignment and fusion may be necessary. Custom moulded orthotics are prescription foot supports which precisely align your feet and legs to resolve pain arising from biomechanical misalignment. Custom orthotics are only prescribed following a thorough examination which may include muscle and joint tests, x-rays and gait analysis. Conditions treated via custom orthotics include: heel spur syndrome; flat feet or high arches; knee pain; patella mal-tracking; shin splints; growth pains; ankle instability; arch pain; forefoot pain – under ball of the foot; lower back pain; leg length discrepancy; illiotibial band syndrome; prevention of abnormal wear and tear of muscles and ligaments, and of ankle, knee and hip joints; prevention of abnormal shoe wear; increased ease of shoe fit for abnormal foot shapes; for children – treatment of growth pains, to help correct abnormal foot posture. Orthotics are very helpful in correcting your foot position, reducing the load on injured areas, and speeding up the recovery process. “They will also allow you to do much more on you feet without noticing the muscle and joint discomfort that poor foot posture causes. This means that you can stand more comfortably at work or home – even for longer periods of time than previously. Or you can play sport and be more comfortable, and less prone to injury. •The computer aided designed orthotics allow precise alignment, by using digital angulation and precise manufacturing. •They will not flatten more quickly than hard orthotics. •They are not as bulky and heavy as they used to be with the old rigid type of orthotics. •They can now be made very slim-line and fit into normal shoes – even some dressy shoes. •The new computerised materials are flexible, yet supportive. •They are more flexible than the older rigid orthotics, making them more comfortable to wear. This flexibility allows them to ‘bend’ with your foot when walking and running to preserve the foot’s natural cushioning mechanisms whilst also correcting any abnormal biomechanics. Verrucae are caused by infection of the skin with human papilloma virus (HPV). 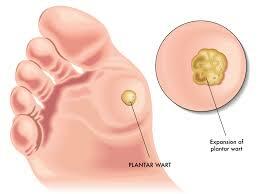 A wart’s appearance varies from a ‘puncture mark’ in the early stages to a ‘cauliflower’ in more mature lesions. Verrucae on non-weight bearing areas protrude into the skin and as a result are more painful. Verrucae are commonly mistaken for corns. 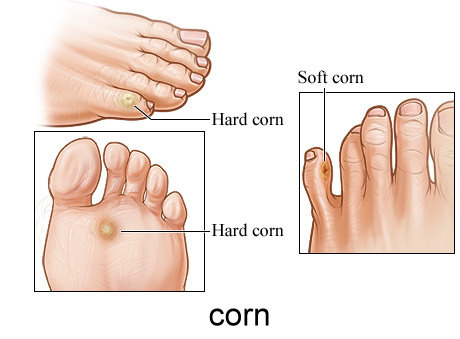 Since corns are caused by pressure, the treatment of the two conditions vary. It is important to clinically diagnose the problem to get the best possible treatment outcome. 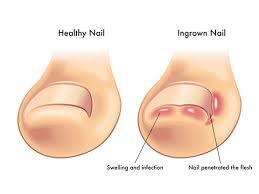 An ingrown toenail is when the side of a nail grows into the skin causing pain, redness and swelling. If the nail penetrates the skin, this can lead to infection and the development of proud flesh. The most commonly affected nail is that of the big toe. The main causative factor for ingrown toe nails is the shape of the nail – the amount of curvature and width. Other factors can lead to an ingrown toenail are poor trimming technique, previous trauma to the nail, a fleshy toe and tight footwear. Treatment by the podiatrist generally involves removal of the offending piece of nail. The treatment provides fast relief of the associated pain and infection.It is important to note that ingrown toenails can be recurrent. If conservative treatment fails to manage the problem, then nail surgery should be considered as a permanent solution. Partial Nail Avulsion (PNA) Surgery is completed in our clinic using local anaesthetic. A section of the nail is removed and the exposed hail root is chemically cauterised using Phenol. Heel pain is a common condition encountered in the clinical setting. It is important to note that is can be caused by various conditions such as heel spurs, plantar fasciitis, plantar fasciosis and nerve entrapment just to name a few. Your podiatrist will need to perform a biomechanical assessment which includes joint range of motion testing, muscle function testing and gait analysis to determine the cause of the symptoms, It is sometimes necessary to get medical imaging such as x-rays or ultrasound to aid in diagnosing the condition. 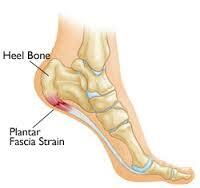 One of the more common conditions that cause heel pain is plantar fasciitis. Typical symptoms include pain during the first steps in the morning and after period of no-weight bearing which then tends to subside. As the condition becomes more chronic, the pain can be present throughout the day. Treatment varies according to the severity of the condition and may include orthotics, soft tissue management (stretching, strengthening, trigger point therapy, dry needling, massage) and footwear advice.